In July 2015, NASA's New Horizons spacecraft sent home the first close-up pictures of Pluto and its moons – amazing imagery that inspired many to wonder what a flight over the distant worlds' icy terrain might be like. Wonder no more. Using actual New Horizons data and digital elevation models of Pluto and its largest moon Charon, mission scientists have created flyover movies that offer spectacular new perspectives of the many unusual features that were discovered and which have reshaped our views of the Pluto system – from a vantage point even closer than the spacecraft itself. This dramatic Pluto flyover begins over the highlands to the southwest of the great expanse of nitrogen ice plain informally named Sputnik Planitia. The viewer first passes over the western margin of Sputnik, where it borders the dark, cratered terrain of Cthulhu Macula, with the blocky mountain ranges located within the plains seen on the right. The tour moves north past the rugged and fractured highlands of Voyager Terra and then turns southward over Pioneer Terra—which exhibits deep and wide pits—before concluding over the bladed terrain of Tartarus Dorsa in the far east of the encounter hemisphere. The equally exciting flight over Charon begins high over the hemisphere New Horizons saw on its closest approach, then descends over the deep, wide canyon of Serenity Chasma. The view moves north, passing over Dorothy Gale crater and the dark polar hood of Mordor Macula. The flight then turns south, covering the northern terrain of Oz Terra before ending over the relatively flat equatorial plains of Vulcan Planum and the "moated mountains" of Clarke Montes. 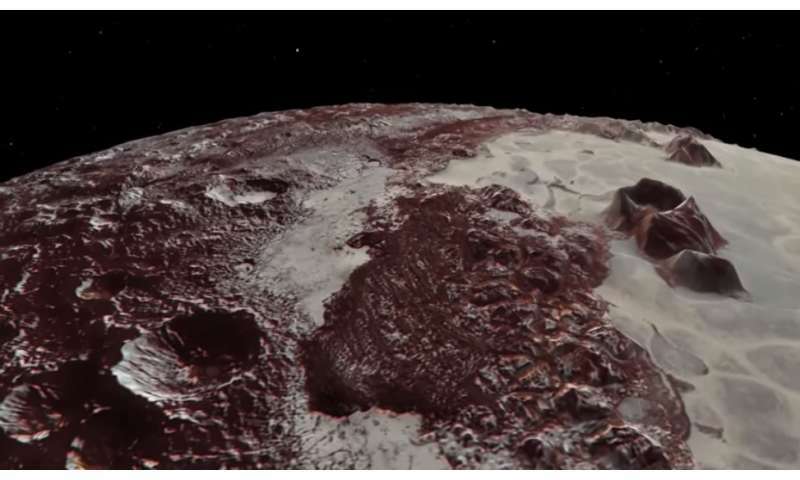 The topographic relief is exaggerated by a factor of two to three times in these movies to emphasize topography; the surface colors of Pluto and Charon also have been enhanced to bring out detail. Digital mapping and rendering were performed by Paul Schenk and John Blackwell of the Lunar and Planetary Institute in Houston. All feature names in the Pluto system are informal.